I Love clean and simple. Anybody who knows my stamping style can vouch for this. Most stampers do have their own style and today’s card is a perfect example of mine. I also love banners. It just made sense to put them on this year’s Christmas card. These little ones were made with Washi tape. I have a nice collection of Washi but I very seldom use it. I am sure this banner made with Washi has been done before, but last night as I was lying in bed (worrying that I haven’t made my Christmas cards) this idea popped in my head. The banners were super easy to make. I just took each piece of Washi tape and folded it over a piece of linen thread, then I trimmed the bottom into a notch. 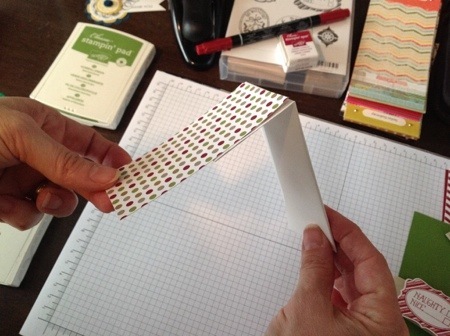 Since the Washi tape is so thin it floats off the card a little bit and looks like a banner should. I am very happy with the way it turned out. 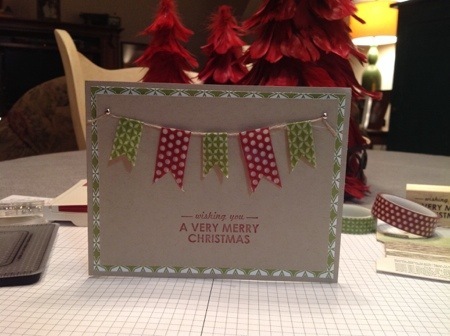 Clean and simple + Washi + Banners = this years Christmas card! 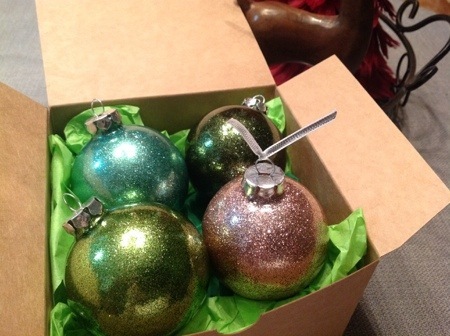 Today I would like to share a favorite project of mine, Glitter Ornaments. It is another oldie but goodie project that has been brought back to life recently through Pinterest. Glitter ornaments look so beautiful on the tree and are so easy to make. They take little effort, little supplies and little money. That’s my kind of project! 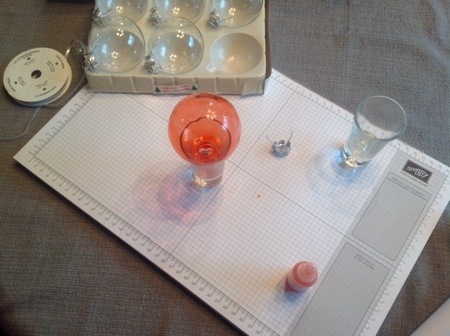 All you need to get started is some inexpensive clear glass ornaments that you can find for really cheap at most craft stores, Stampin’Up! 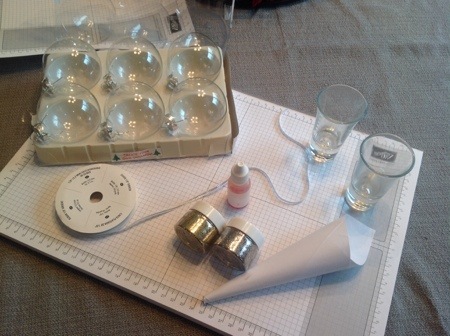 reinkers, glitter, a small funnel, a small glass or two for draining, and some ribbon (optional). I have all my supplies laid out for you in the following photo. 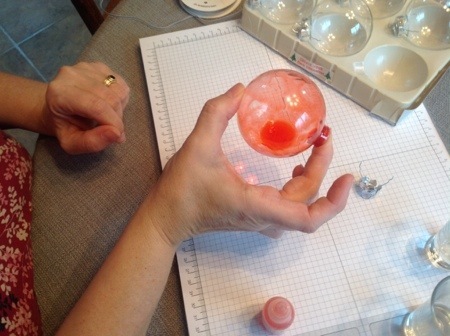 The first thing you will want to do is to gently remove the top of the ornament and then take a reinker and squeeze a good amount into the ball. You will want enough to coat the entire inner ball with a thin coat of ink. Take your time and swirl it around so that there are no naked spots. You have to be patient in getting the whole thing covered because the bare spots will show through if you have them. I like using the old style reinkers for this project because the ink is easier to spread. 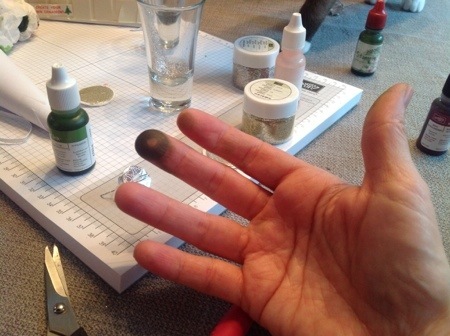 If you use the new style ink you might need to add a few drops of water. I had success with 25 drops reinker and 3 drops water. (The old ink needs no water.) 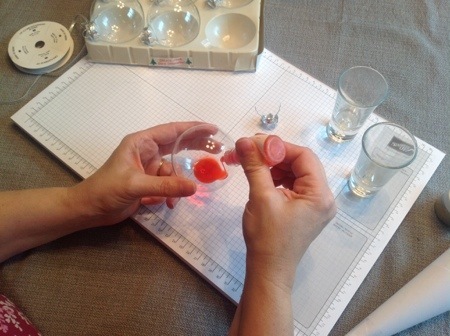 After the inner ball is covered then turn the ball upside down and let the excess ink drain into a glass. Now for the magic. 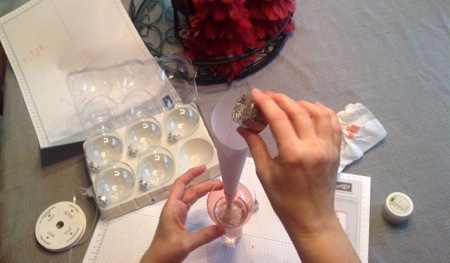 Insert your funnel into the top and pour apx. 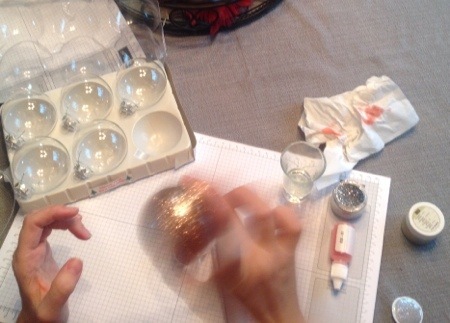 1 teaspoon of glitter into the ball and give it a good shake. Make sure you are covering the opening well as you do so or you will have a glitter wonderland in your craft room. you can empty any excess glitter back into your glitter jar. There is no need to let anything dry. The glitter is there to stay. I have no idea what makes it stick so well but I have some that ore over 5 years old and they still look the same. 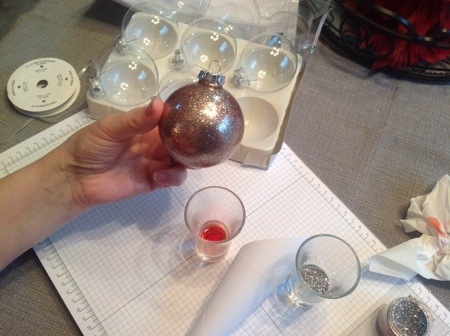 Next you just pop the top back onto the ornament and…. Taa-daaaa!!!! Isn’t it beautiful???? I used Pink Pirouette ink and silver glitter on this ball. Go ahead and get crazy with different colored inks and glitter. I have never seen a color combination that hasn’t been stunning. You will have these all over your tree if you love glitter as much as I do. They also make a lovely gift and 4 fit perfectly in the extra large gift box found on page 37 of the Holiday Occasions Mini. One last photo for you and a disclaimer….You WILL have technicolor fingers at the end of th eday so you might want to wear gloves. I would like to share one of my latest obsessions. 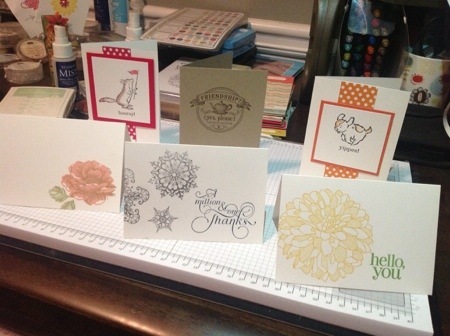 I have become addicted to these great little note cards and envelopes that Stampin’Up! sells on page 162 of the annual catalog. As you can see below, I have made some very quick and simple cards. I tend to stamp in multiples so the simpler the better. Sometimes you want a nice little note card that is not too fussy and these meet that need. I think they are great as a single card, but with Christmas around the corner I like to have quick gifts on hand for special people who I am on a more casual level with. 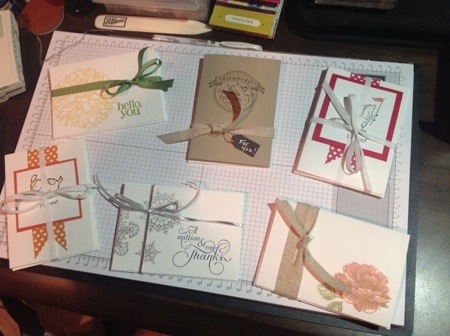 I love to package these note cards in groups of 4 or 8 for a perfect gift. Because it is simple and inexpensive it makes it easy to give them to all those who make little differences in our daily lives. I have always believed that the way you package and present a gift is just as important as the gift itself. By taking these little note cards and tying them up with coordinating ribbon you have a gift that is truly beautiful in presentation too. I always have these on hand year round for hostesses, teachers, co-workers or anybody that needs a little pick me up. Giving a gift from the heart like this will bring a smile to both of your faces. I hope you will join me here at Tap Tap Stamp on Sundays and Wednesdays as those are the days I will be posting for now. From your feedback, I think that the picture tutorial was a hit – so I plan on another one this Sunday. Make sure to follow me so that you don’t miss it! *I just want to point out that the Crumb Cake cards above were made from our card stock but we do sell the small Crumb Cake envelopes. The pre-cut note cards and envelopes are only sold in Whisper White. Hi and welcome to Tap Tap Stamp. I bet you found me through my upline, Mary Fish. 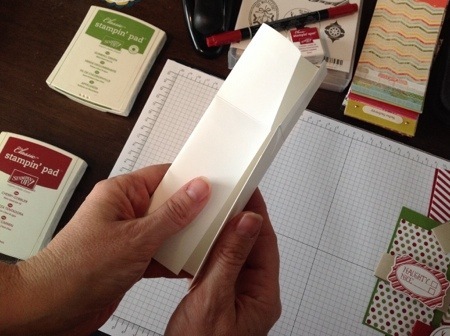 I am thrilled that she invited me to be her guest stamper on the day of my first blog post! Let me start with a quick introduction. 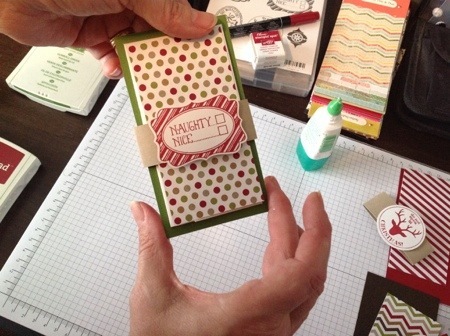 My name is Pam Morris and I have been a demonstrator with Stampin’Up! since 2001. In March of 2012 I made the decision to drop and sign back up under Mary. It was one of the best decisions I have made in all my years as a demo. Less than a week later I was contacted by a local stamper who was interested in getting back into stamping. I was thrilled to begin recruiting and couldn’t be happier to sign my first downline, Brian King. Weeeee…Let the fun begin, right? Little did I know that my business would put me smack dab in the middle of a Fish and a King! I feel that I have some pretty big shoes to fill but there is no place that I would rather be. My project today is a long time favorite of mine. 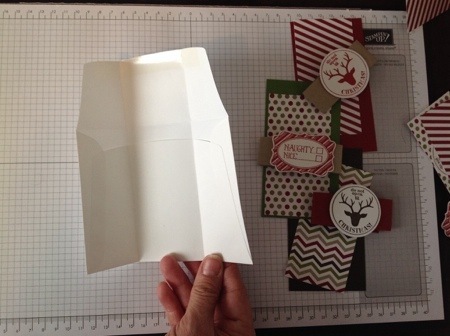 I have been making these envelope gift card holders for over 10 years. 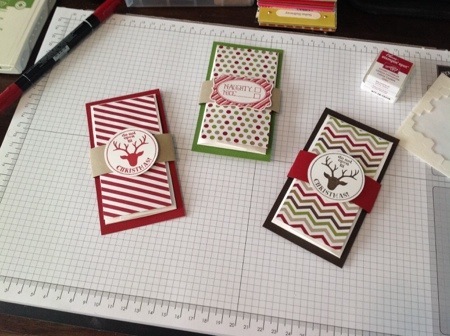 I keep them current by using Stampin’Up! products that are always on trend. I love the design and colors in the Seasons of Style Designer Series Paper that you can find in the 2013 Holiday Catalog. It pairs perfectly with the Very Merry Tags set. 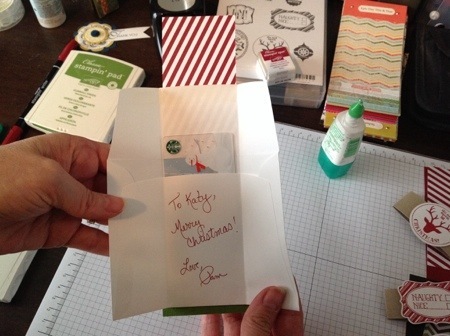 I have a picture tutorial to help you see how I made these cards that your friends and family would be thrilled to receive. You first start with one of our standard envelopes. Score it at 4″ and then flip it and score again at 4″. 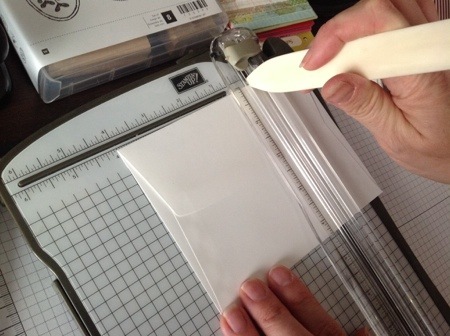 I like to use my bone folder or stylus when scoring envelopes with my trimmer because it gives a deeper score through the layers. Once scored, open the envelope flap and fold in on the score lines as shown. 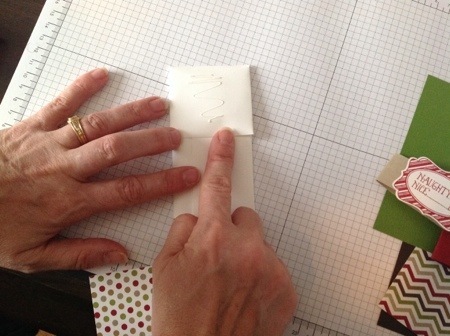 Add adhesive to the outside flap only and adhere a piece of 2 1/8 x 4 1/4 designer paper to the flap. When you open the envelope up you have a perfect sized pocket for a standard sized gift card or some cold hard cash if you wish. You can tie it up with a ribbon or a belly band as i did. I took a piece of 1″ x 7″ card stock and loosely (so that you can easily slide it off) wrap it around and add your embellishment. I used stamped images and pop dotted them onto the belly band. You can also see that I glued the envelope onto a piece of 2 5/8 x 4 7/8 coordinating card stock to give it an extra layer of WOW. I hope you learned a little something new today and will give these a try. It makes an impersonal gift card a gift from the heart! Thank you for stopping by Tap Tap Stamp on my opening day. I hope you come back soon!